Broomfield residents, quality sewer repair in Broomfield does not necessarily mean that an expensive and disruptive project needs to take place on your property. There are many times when a sewer inspection in Broomfield will reveal the source of the problem is minor and easy to correct. A routine Broomfield sewer cleaning can also prevent a lot of issues from developing in the first place. 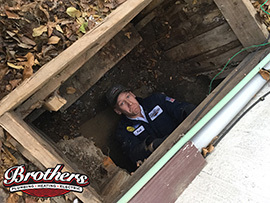 Brothers Plumbing, Heating and Electric is a trusted and reliable name in the Broomfield and Denver sewer inspection community. Our experienced plumbers have worked on all types of Broomfield sewer repair jobs, and they know how to find effective solutions. The first step is to perform a comprehensive Broomfield sewer inspection in order to examine every last inch of the system. This will enable the plumbers to ensure that nothing is overlooked in order to completely address problems once and for all. We work hard to avoid performing Broomfield sewer replacement services unless they are absolutely necessary. We can replace sections of pipe and provide thorough rooter services to remove stubborn clogs. We can even re-line pipes and make them as good as new. However, there are situations when a complete Broomfield sewer replacement is the best option to consider. Broomfield sewer inspection uses minimally-invasive techniques and we work hard to finish the job as quickly but as thoroughly as possible. Our goal is to help property owners to have the most reliable and long-lasting sewer systems installed with minimal hassle and expense. Anyone who is experiencing persistent backed-up drains, problems with their toilet or foul odors emitting from around the home should contact us as quickly as possible. Our Broomfield sewer inspection can be conducted in a single visit, and we can develop an effective solution. We are Broomfield sewer repair professionals, and our company is proud to serve residential as well as commercial customers from all over the area. You can count on us to be there when you need us the most, and we respond to emergencies day or night. However, you can also take advantage of our preventive services to ensure that your sewer system is performing flawless as well. A thorough Broomfield sewer cleaning may be all that is necessary to eliminate your drainage problems. It only takes us a few minutes to assess the situation and develop the most appropriate form of sewer repair in Broomfield. Schedule an appointment for a sewer inspection in Broomfield today.